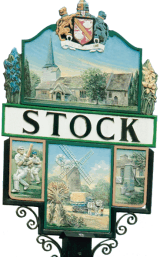 Sunday 7th April, 7.30 p.m..
STOCK CARES  CAN YOU DRIVE? Stock Cares is a local community initiative which exists to assist anyone who have no means of getting to health appointments. Currently we are experiencing difficulties in meeting the demands of our clients and urgently need more volunteer drivers. We also need new co-ordinators to take calls and allocate drivers. If you think you can spare a few hours a month, please get in touch with Chairman, John Sawkins, on 01277 840884, or email at jwsawkins@gmail.com who can give full details. All expenses are reimbursed. Business in Stock is a community of local businesses that help and support each other. Although there are free ads, I recommend that any local businesses get intouch with this group. Bogus Police Officers: A group of males have recently been involved in committing distraction burglaries in the Basildon, Brentwood and Thurrock areas, by posing as Police Officers. They have fake but very convincing Essex Police Identity Cards and use these to trick and scam their way into vulnerable people's homes with the intent to steal cash and valuables. Bonfire Warning Please check bonfires thoroughly for sleeping hedgehogs and other mammals. Even better, move it before lighting it. Do you have any pictures of \Stock that aren't on these pages? The Heritage centre would love a copy and we would love a scan of them.